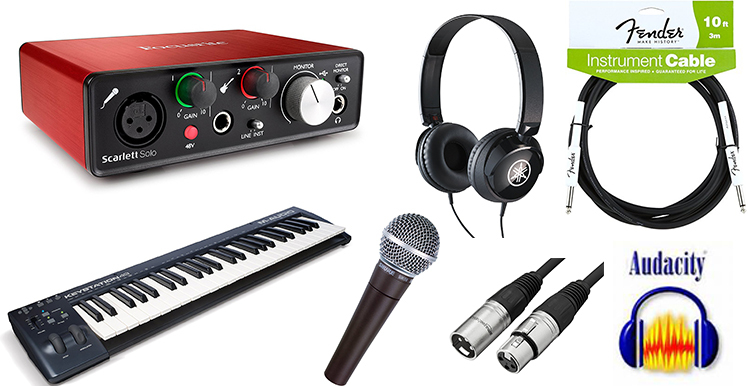 The music and recording kit includes equipment used for audio recording and editing. Users can bring their own instruments and use the Focusrite Scarlett Solo and Shure SM58 microphone to record studio-quality music, then utilize the software "Audacity" and "Reaper" installed on the accompanying laptop (labeled Reaper) to make edits or changes. This laptop is loaded with video editing software, allowing users to add their own custom soundtracks or narration to their personal videos. So the noise from the recording session does not bother other patrons, and so the library noise does not affect the recording, generally it is best if a room with a door can be provided to patrons to use as their "temporary" recording studio. A table or desk will be needed for the laptop computer and accessories. Space may also be needed to accommodate musicians and assorted instruments they may bring in. Electrical outlets will also be required. For more information, contact JoAnn McManus.